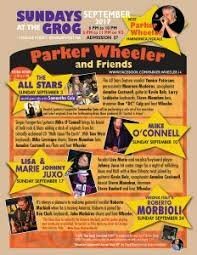 For the past twenty- seven years, since 1990, Parker Wheeler has hosted his Sunday Night Blues Party at The Grog, in Newburyport, Massachusetts. 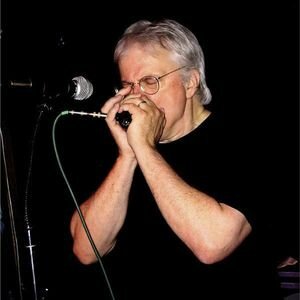 In the process, he has become a local legend because of his great talent playing the blues harp, and for bringing the best artists in the area to participate and perform at his North Shore long- time landmark jams. Wheeler’s parents met in college, as seniors at the University of New Hampshire, and he was born on May 16, 1947. His dad went on to get his Ph.D. at Yale University and became a Professor of Sociology and History. His mother was an artist, sculptor and designer who passed away when he was just two years old. Parker’s childhood introduction to music came via the old Philco radio next to his bed at his father’s parent’s house in Provincetown, MA. Late at night, he heard rockabilly from the south, blues from Chicago and Kansas City, and r & b and jazz from all over. By 1965, Wheeler was living full time in Boston and he met some musicians who were forming a band. 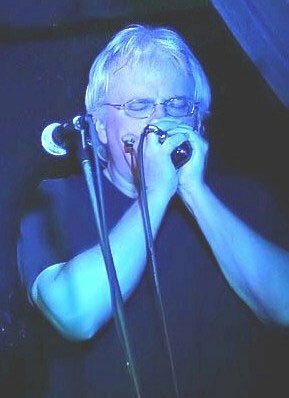 He joined up as vocalist and harmonica player but he had a problem. He had to learn how to play the harp fast. “I went to the music store and having ascertained that most rock and roll was in the key of E, I bought an E harp. This is how I learned the concept of cross harp. To this day, I always play four keys above whatever the key the song is in.” From December 1965 to March 1966, Wheeler wandered through The Bahamas where he found, to his surprise, local bands playing American and English rock and roll. He began sitting in and started his crossover to blues based rock. In 1969, Parker moved first to Louisiana and then on to Los Angeles before coming back to Massachusetts. In November, 1970, he got a call to join George Leh’s band Swallow who were recording a session for their Out Of The Nest release. He was asked to track a harp solo cold on the song “Why Am I Treated So Bad?” He played with the group until 1973; and the band fell apart in the mid seventies. A couple of the horn players and him were living in West Newbury, MA and he met sultry singer Jeanne French when the horn players and him went to see her perform onstage and decided that she was a lot better than her rhythm section. They soon formed the band Hot Romance with her. Like all bands, this one dis- banded, and from 1976 through 1989 he did little performing. There was a brief stint with a c & w band and some studio work but for all intents and purposes Parker Wheeler was out of music.